Its always nice to have variation than regular we cook, so this recipe will be nice specially for the people with sweet tooth. Well we all enjoy sweets ocassionaly. Apple Halwa / sheera is different from the regular halwa / sheera we make. 1. Heat 2 tbsp ghee in a pan. 2. Add the apples and fry them for 5 minutes. Stirring often till they becomes soften. 4. With the help of spoon mash the cooked apples and keep on stirring so that the mixture does not stick to the bottom of the pan. 9. Continue to cook for 5 minutes more. 10. 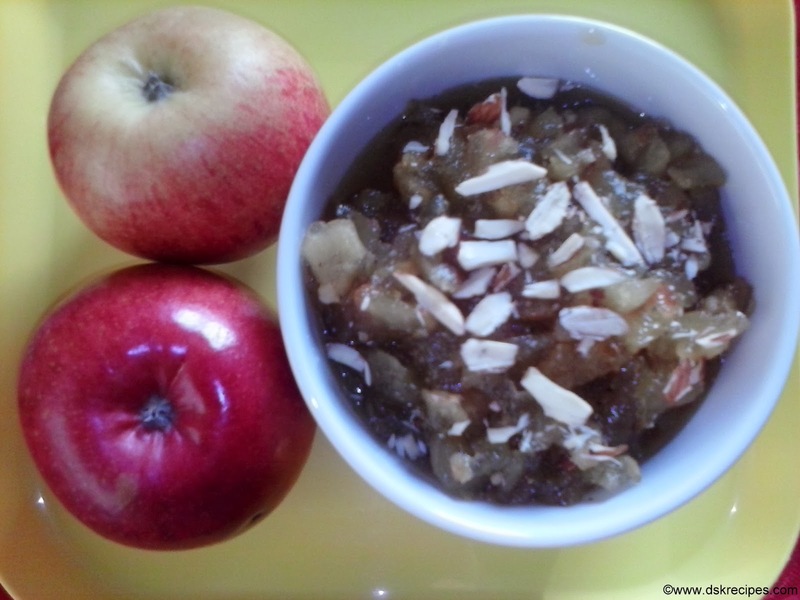 Garnish with almonds & serve apple halwa warm or cold. Thanks to Gauri Pimprikar for sharing the recipe.